Vanlife Log, day 12. Since our near stranded escapade of the van not starting, we decided to move down to a lower elevation. It was still cold, but we are talking 20 degrees cold, not zero degrees. It almost felt warm. Almost. Living the Van Life in the cold is proving to be more challenging than we expected. While we do have the wood burning fireplace inside the van, we have not yet figured how to keep it going overnight. And we are not quite sure if we want it to burn overnight, while we sleep. We do have a carbon monoxide detector, but even so, it seems a little more risky then we are willing to try with baby on board. So we are using an electric temperature controlled heater at night. While it works wonderfully, it takes way more power than our 300 watt solar system can provide. So in this cold, we have to stay somewhere that we can plug into electricity. Which means, we are currently campground hopping. We located a KOA around Central City, just a few miles away from the casino. As we drove up the hill, we saw a restaurant advertising Elk and Bison burgers. We decided to stop. The burgers were delicious, and all the toppings tasted garden fresh. 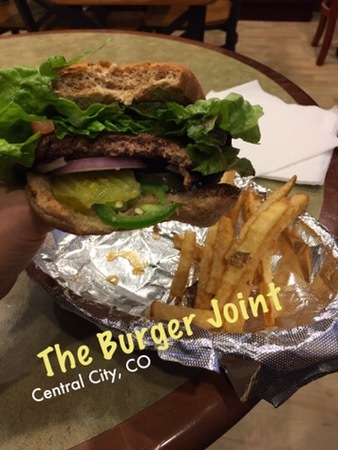 I had one with fresh Jalapeños! Dinner, done. Now for sleep. There was no one in the office at the KOA campground. If anyone had been there, they had gone home for the day. To the right of the office door was a drop down bulletin with information on night time check in, a map of the campground, and the code to unlock the bathrooms. 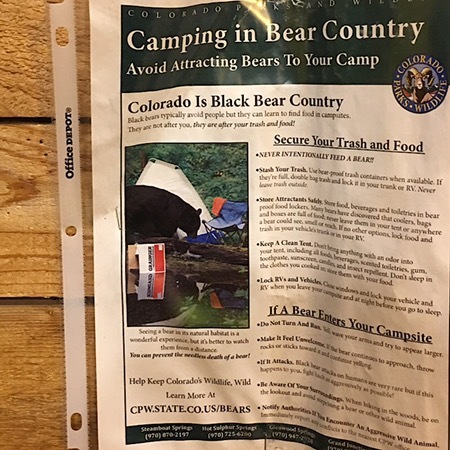 There was also information on camping in bear country. Awesome. I think we’ll keep the van doors shut tonight. 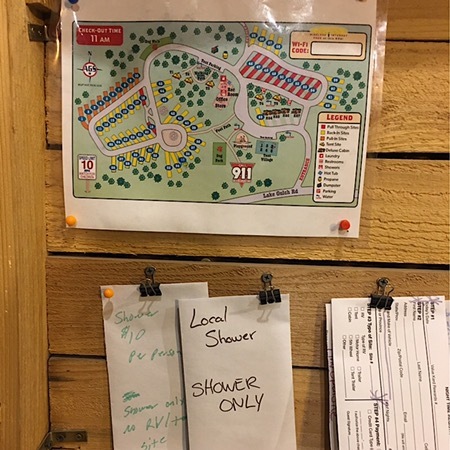 Apparently this KOA offers shower access for non-campers as well. Good to know! I will be adding this to my list of Free places to Freshen up. Have you done Night Time check-in at a campground before? How was your experience? Were you able to obtain access to the whole campground, or did you have to wait until they opened the office in the morning?